It probably seemed like the wait would never end, but you finally got your “good to go” check-off from your doctor and you can start exercising “for real” again. So now what? Where do you start when your body feels like it’s been turned inside out and back again? Even if your delivery was as smooth as can be, it might be weeks before you feel like you can even walk around the block without breaking into a sweat — which was exactly how I felt, even though just 10 months earlier I was in the best shape of my life. That was no fun, so I wanted to offer some helpful information for when your doc gives you the green light. This is Part 1 of a two-part series, so be sure to read on! First off, more than anything, be kind to yourself through this process. Your body just did one of the most amazing things imaginable (you know, creating and birthing a tiny human) and you need to recuperate. Be patient! Think of a past athletic endeavor that was a true reach for you — you set a PR, you went further than ever before, you hit a new benchmark. Most likely, your body was tired after that amazing accomplishment. And you most likely spent the appropriate amount of time recovering and healing; all good athletes understand the importance of that, and research backs it up, too. Similarly, after childbirth, you must stay the course and allow your body to complete the healing process. And not only your physical body but your mental and emotional “body” as well. That’s where self-compassion comes in. Leave the judgment at the door and understand that on your return-to-fitness journey, what takes another athlete-mom four weeks might take twice as long for you. What’s most important is letting your body rebuild the strong and healthy foundation you had going into your pregnancy. This foundation also will set you up for goals beyond fitness, such as being a good mom to your little one, and perhaps even another pregnancy. The best way to start your fitness routine again is to work backward. What were you doing for movement/exercise during the last few weeks of your pregnancy? Were you doing gentle yoga or neighborhood walks? Or were you able to stay a bit more active with hiking or moderate lifting? Remember, as your hormones continue to rebalance following delivery, it’s important to keep things low-impact. In Part 2 of this series, we’ll discuss how ligament laxity and loading joints too soon during the post-partum period can lead to potential injuries. What about training volume? That’s a question I get frequently from new athlete-moms, and it’s best to stick with the same basic formula most athletes use with any volume changes: the 10% rule. You should aim to increase training volume by no more than 10% per week. This could be based on total time, total distance or a combination of both. For example, if you were walking for 30 minutes four times per week (a total of 120 minutes) in the last trimester of your pregnancy, your goal would be to increase by 12 minutes each week. You must frequently assess how you are doing as your volume increases. Feeling more fatigued than energized from your sessions? Are aches and pains popping up that weren’t there the week before? Back off for a week. Take rest weeks or blocks of days. Your return to fitness needs to be period-ized, just like your intense training blocks were. Give yourself chunks of time where you switch activities or take a major break. I hope this has provided you with a bit of inspiration, education, and motivation. Check out Part 2 of this post, which will dive into how to handle some of the physical obstacles you might encounter when you first start working out again. You’ll also get key tips on nourishing your body during this time. Need a plan to help you get started? 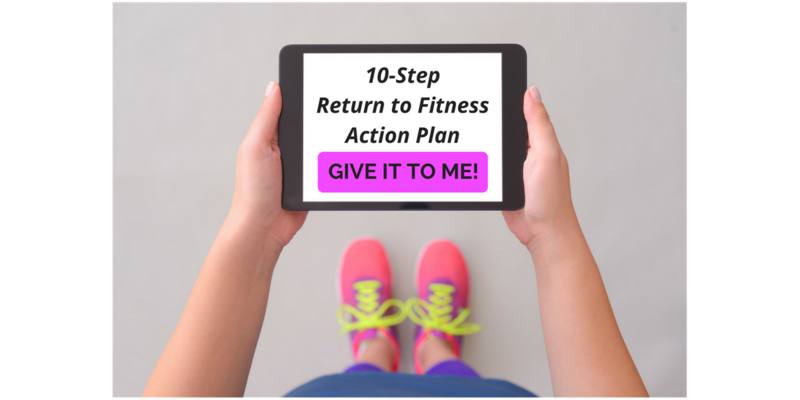 I’ve created An Athlete-Mom’s 10-Step Return-to-Fitness Action Plan — a free guide that will provide you with some of my favorite resources, tips, tricks, supplements and ideas to get you safely and quickly back to whatever athletic pursuit you choose. You can grab it here!